If you’re at all versed in the world of nutrition, then you’re likely all too familiar with fermented foods. You know that they contain probiotics (aka good bacteria) which help crowd out the bad bacteria, and can assist with better digestion and stronger immunity. Cultures around the world have been fermenting their food for centuries, more so as a method of preservation, but with the attention fermented foods have gained for their positive effects on the gut, they have taken on a whole new level of importance for us today. However, just like adding a sprinkle of turmeric to your latte won’t cure your chronic inflammation, fermented foods need to be incorporated into our diets on a regular basis and in somewhat significant amounts in order for us to reap their benefits. 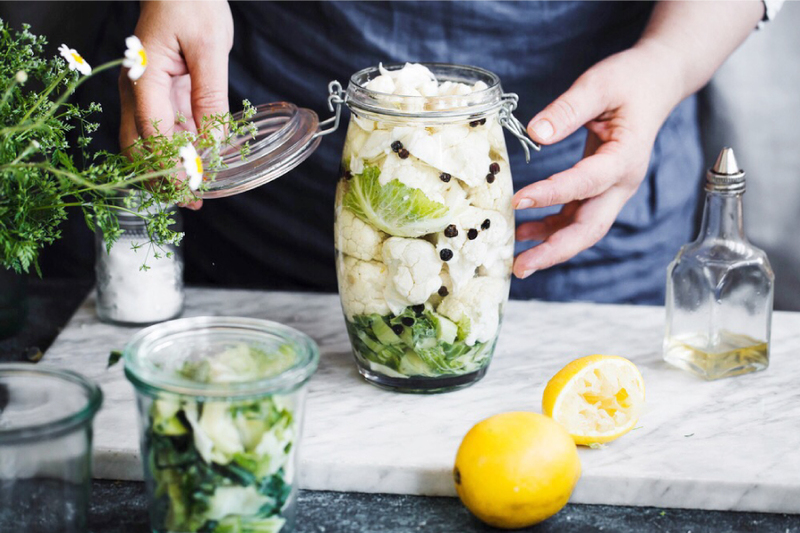 With Ferment Fest Vancouver coming up on September 16, we thought we’d break down some of our top choices for fermented foods, and how to easily incorporate them into your diet. Tempeh is a new favourite after having spent a month in Bali, where it was been a staple in their diet for ages. If you’re not familiar with tempeh, it’s protein rich, fermented soy which is often used as a meat replacement because of it’s crumbly texture and subtle nutty taste. Favourite way to eat it: While I’m always intrigued by tempeh “bacon” at restaurants, my personal favourite way to eat it is in a chilli. Particularly if you aren’t super into the flavour, tempeh is the perfect meat replacement and in dishes like chilli, it typically takes on the taste of the sauce. A great local brand we love is Tempea, which uses certified organic, non-GMO soybeans sourced from Canada and the U.S.
You likely grew up associating sauerkraut with hot dogs, but it is so much more than a garnish. As a reminder, sauerkraut is simply fermented cabbage, and is one of the easiest ways to add fermented foods to your diet (and the simplest fermented food to make at home). Favourite way to eat it: If you’re looking to spice up and add a little extra nutrients to your avocado toast, try topping it with a little sauerkraut. Word of caution with kimchi: don’t go crazy with it off the bat. Kimchi can be intense and if it’s digestive issues you’re trying to solve, too much kimchi is not going to do you any favours. Kimchi is however a great way to add lots of flavour, nutrients and probiotics to any meal. A personal favourite brand (they also have a few different flavours) is Wild Brine. It doesn’t taste as intense as some other more traditional brands and is a great place to start if you’re curious about trying kimchi. Favourite way to eat it: I love to top quinoa or rice bowls with kimchi for an extra kick of flavour and probiotics. A list of the top fermented foods wouldn’t be complete without a mention of kefir. If you’re unfamiliar with kefir, it’s a cultured (traditionally) dairy product that is very high in probiotics. Not into dairy? You can also make it/find it with coconut milk or even coconut water. Favourite way to drink it: The easiest way to consume kefir is to add it to a morning smoothie, or even drizzle it over some granola and fresh fruit for breakfast or a snack. While we (along with many, many other people) are huge fans of kombucha, we try to treat it more as an alternative to juice, pop or alcohol, as opposed to a powerful health tonic, as it is often praised. While kombucha is a fermented beverage, and so does contain probiotics, it’s not going to be as strong as some other probiotic-rich foods, and many brands are still adding a lot of extra sugar. For this reason, not all kombuchas are created equal. When you’re choosing which brand to buy, opt for ones with lower sugar content, GTs is a great option and we are particularly loving local Vancouver brand Hoochy Booch. Favourite way to drink it: As an afternoon treat or when out for dinner and not drinking alcohol. Maybe you’re only familiar with miso as it relates to miso soup, but this fermented soybean paste is a great option to add some salty flavour and probiotics to sauces and dressings. Favourite way to eat it: My personal favourite way to eat it is simply with hot water. This is great for when you’re having digestive issues and you want to give your gut a break, or can be made into a variation on pho if you add some rice noodles, tofu and veggies. Our favourite flavour and brand is Amana Genmai Miso which you can find at Whole Foods. For details on Ferment Fest Vancouver, visit their website here.